Relax with family and friends downstairs or bathe in the sun on our very spacious deck. Children love the fishing right off the deck and the crabbing is great. Great area for jet skiing. Launch near by. You will not want to miss the sunset view. Be sure to have your camera handy. Wildlife viewing is wonderful. Spacious home, but yet private. 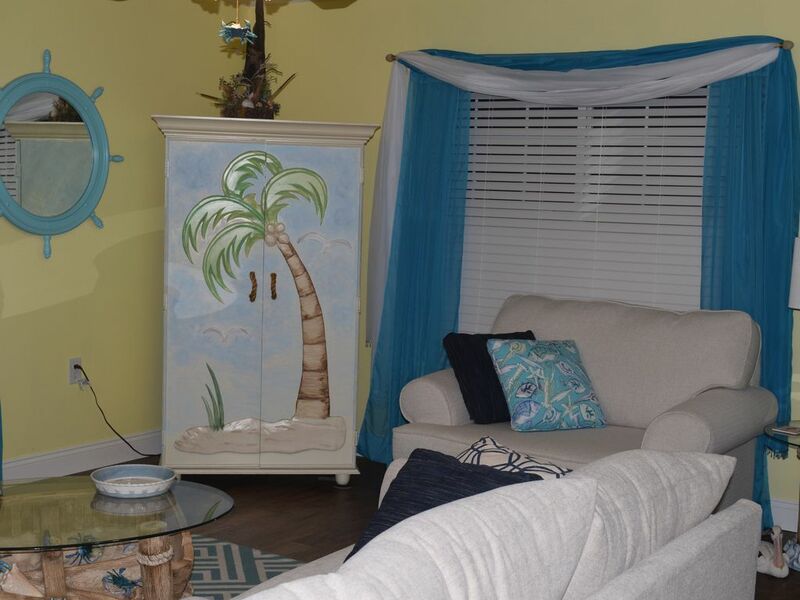 This beautiful, Gulf Shores home is located down Fort Morgan road and is perfect for children and just some R&R. Located on the Bay, with easy beach access. This fully-equipped home is a non-smoking house and offers lots of amenities. Private deck upstairs and downstairs you can grill, fish, crab, jet ski, boating, sailing, swimming and lounging. We area located only minutes from the Fort Morgan Ferry and Fort Morgan is a great historical attraction for the young and old. Launch your boat just minutes away and tie up to our pier. Arise early and off you go, to catch the big one, you will be in the gulf in about 15 minutes. Our grandchildren fish, swim, crab and watch dolphins off the pier for hours at a time. We catch trout, red fish, catfish, croaker and mullet. If you can throw a net you can catch your bait fish off the pier as well. I am an early riser and will slip out on the deck upstairs and watch the sun rise with my coffee. The same can be said for our sunsets, be sure to keep your camera handy at all times, you never know what you will see, we have had geese in our back yard, pelicans lay eggs on the pier, pelicans sitting side by side, dolphins swimming under our pier and within yards of our children swimming. Be sure to check out the Beach Club across the street, we walk. They have food trucks, restaurants, games for the kids, great gift shop and music every night during summer and early fall. Wonderful, quiet place to stay! We have stayed at this house for a week twice. Both times were fabulous! Quiet neighborhood away from the partying and hustle and bustle. Having a private dock to fish from is great, very peaceful. Town is almost a half hour away, so not bad. The State Park and Orange Beach are a little bit further but we like it that way. The house has always been very clean and tidy. No problems. Highly recommended for those wanting a quiet getaway! Nicely appointed, very clean and comfortable. The home was nicely cared for and clean. The furnishings were comfortable. Unfortunately the VCR/DVD player didn't work - and since there were gale force winds it was an inside kind of day, and we couldn't use that feature. Also, I expected that there would be sufficient toilet paper, but it was minimal - we'd have to buy more if we were staying even one more day. When I booked this...I had no idea how beautiful this place really is. The house is beautiful..clean and the dock is amazing. House is big enough for our group of 8 comfortably. It is breathtaking, really. Special little touched everywhere, like beautiful plates- a huge pelican next to the front door- and a beautifully set table. We come every year and will definitely return to this place. Very clean and responsive service, loved watching the sunrise and set everyday. Great location! Fishing off the pier was great and very home like fell. Would love to have a TV in one of the bedrooms. Thank you so much for the wonderful comments. We are so glad you had a great relaxing time. As for the TV my husband and I went back and forth with this. We elected for only a TV in the great room as our focus was on encouraging more family time. My husband felt your way but so far I am winning 😆. We will revisit this again and we enjoyed having you guys at our home. Beautiful home. Nice location. Affordable. Our family loved catching stingrays and crabbing and swimming and watching dolphins, pelicans, seagulls and herons from the private pier. The house was large and comfortable and beautifully decorated. Will definitely stay there again if we have the chance to be back in Alabama. Perfect house for guys fishing trip. One of the guys caught a bunch off the dock. Across from the beach on the bay side. Very relaxing and laid back. Fun in the sun without all the hassell. Grilling, fishing, swimming and crabbing at your leisure. Walking distance from the beach club where food, fun, games and music to be enjoyed every night, very family oriented. Take the ferry to dauphin island. Dolphin watching right off the pier. The most beautiful sunsets you will ever see. Tacky Jacks II restaurant is just five minutes away. Enjoy the marina at tacky jacks to see all the catches of the day. Book your fishing charter and request to be picked up right off the pier. Or stay home and fish right off the pier where you can catch trout, red fish, mullet, croakers and more. Our place is a great place to make great memories especially if you have children.